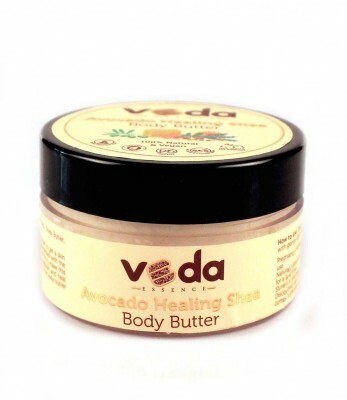 Veda Essence Natural & Pure Avocado Healing Shea Body Butter : Use this rich and creamy blend of African Shea butter and Cocoa butter to get a skin smooth and soft as silk. The most tempting nutty butters is complemented with the refreshing scent of Lavender essential oil. Beeswax, Avocado Oil and Vit E make this blend more luxurious & rich. Use this super rich body butter to condition and heal your chapped and dry skin. Calendula Petals add a beautiful texture to the body butter making it irresistible to not use.